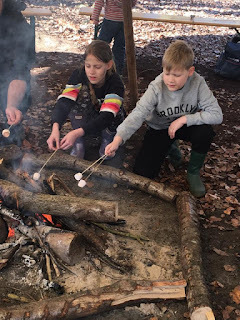 Mum of Five Staying Sane: Our day out with Camp Wilderness. Learning bushcraft, team work and enjoying valuable family time. Our day out with Camp Wilderness. Learning bushcraft, team work and enjoying valuable family time. A couple of weeks ago we were invited to Camp Wilderness Hatfield Woods for the day. The day started at 10.30 and after a rather stressful attempt at finding where we were we arrived and settled ourselves in front of the camp fire. The children were a little apprehensive about what the day entailed but were happy to be outdoors and the sun was shining. We were split into groups and our first task was to design a tribe flag and think of a name for our group. We were with other families that we had never met before and it really brought us together as a group and got us talking and discussing our tribe name and the design of our flag. After we had designed our tribe flag we went back to the camp fire and showed everyone our design. We were then shown all of the different ways that you can make fire. All of the demonstrations were explained well and the children really enjoyed this part of the day. We then had to head off to gather wood to build our own camp fire to cook our lunch. The children enjoyed gathering lots of wood to keep our camp fire going strong and Thing 3 started off the fire to cook our burgers for lunch. Whilst lunch was cooking we were allowed to make more fire (Thing 3's favourite part of the day! ), make things out of clay and sit around the camp fire talking to the other families. The children gathered more wood and played in the sunshine. After lunch we learnt about camouflage and how we can hide ourselves in the woods. 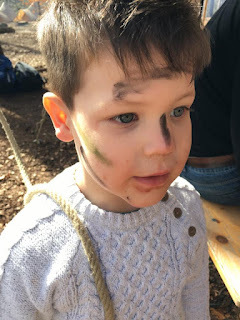 We all got to try out the camouflage face paint and then we all went off for a few games of hide n seek in the woods. The children loved running around and hiding behind the trees so they couldn't be seen, I think the hubby liked it too! We also made survival bracelets which got us all quite frustrated until we got the hang of how to thread the cord! Finally we were shown different ways to make traps to catch animals when out in the forest and we were also shown some animal skins from animals that had been caught. The children had to guess what animals the skins were from. At the end of the day (around 4pm) we had hot chocolate, rice crispie cake and toasted marshmallows over the campfire. It was the perfect end to a perfect day and it was the best day out I had been on in a long time. The children were tired out, exhausted, dirty but very happy and had also really enjoyed the day too. Not one had asked for an iPad or a TV or even exclaimed that they were bored. I would highly recommend Camp Wilderness for the children. After an apprehensive start to the day Thing 3 said she would definitely return and would happily stay on on of the residential camps. We were well looked after, well fed and we learnt so much from our day with the Camp Wilderness crew. There is one more open day planned at Camp Wilderness Hatfield Woods on May 13th 2017. Camp Wilderness runs three and five day residential camps all over the country for children aged between 6-15 years old throughout the summer holidays . 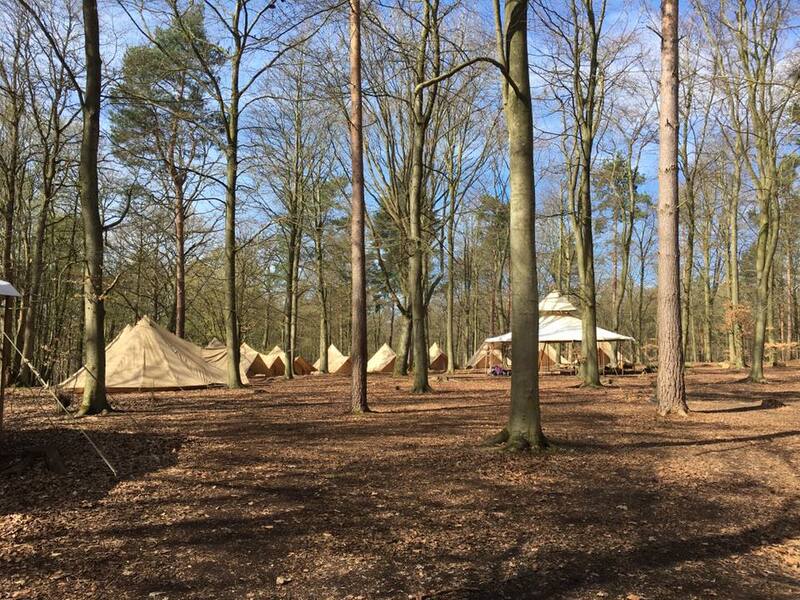 Activities at the camps include; fire lighting, shelter building, wilderness cookery, camp craft, bushcraft tournament, fireside stories and more. Camp rules were the first topic of the day and also very important to listen to and follow when in the camp. The bell tents look great all set up and ready for their first residential occupants and the camp was well set up, organised and equipped. To find out more head to the Camp Wilderness website for more information. 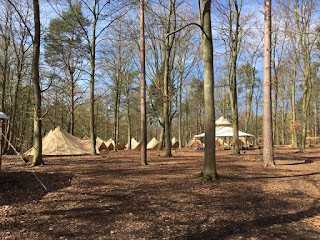 We would like to thank all of the staff on the day for looking after us, keeping us well fed and watered and teaching us all of our bushcraft that we learnt on our wilderness day out. I made this video of our day with Camp Wilderness, I hope you enjoy it and it shows a little of what we did on the day. Camp Wilderness 2017 from Laura Bovington on Vimeo.